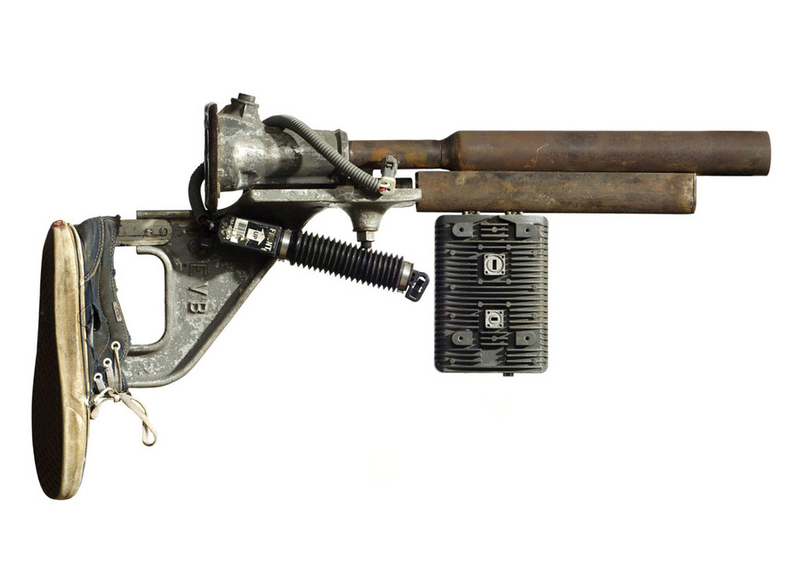 In 2012, following the Sandy Hook Elementary School shooting, Baltimore artist David Hess felt compelled to accelerate the construction of an unusual series of sculptures: life-size mock assault rifles fashioned from everyday ordinary objects. “This body of work is my personal awakening to the American obsession with weapons and the abstraction of violence,” says Hess. Taking discarded bits of things (“rescued” objects, he calls them) that most people would consider trash — a vacuum cleaner, the handle of a saw, an old black sneaker, a pink Barbie bike frame, a raggedy crutch, the body of an electric guitar, a turquoise sewing machine — Hess fashioned strikingly realistic-looking “guns” for exhibition, to prompt conversations about violence in America. Hess’ work came to the attention of Kathy O’Dell, special assistant to the dean for education and arts partnerships, and associate professor of visual arts, art history and museum studies, who has organized an exhibition, simply titled Gun Show, of all 112 of Hess’ gun sculptures at UMBC’s Center for Art, Design and Visual Culture, opening on September 4 and continuing through October 14. An opening reception with the artist will be held on Thursday, September 7, from 5 to 7 p.m. 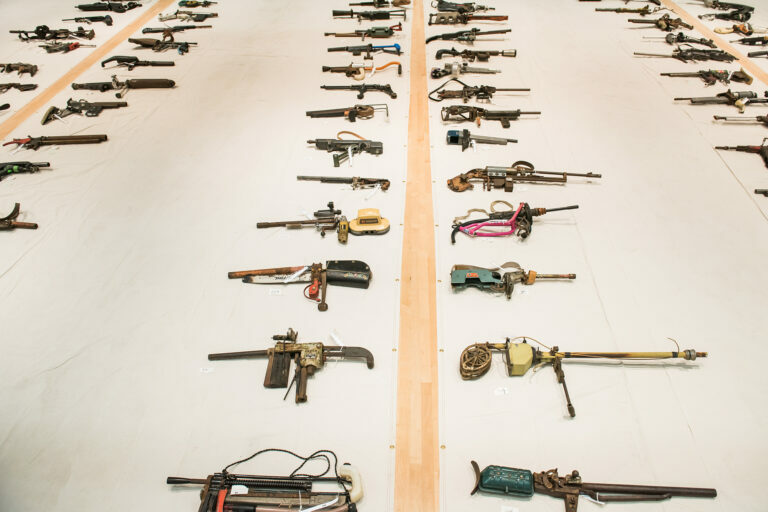 The exhibition displays the sculpture on the floor, laid out on tarpaulins, recalling the presentation of bodies awaiting identification following disasters, or the arrangement of confiscated weapons at police headquarters. Ranging in weight from 8 to 44 pounds, the mock guns include no shooting mechanism. David Hess’ work has been exhibited at Goya Contemporary in Baltimore and the John Elder Gallery in New York. His work can be found in numerous private and public collections, including the American Visionary Art Museum, Baltimore/Washington International (BWI) Thurgood Marshall Airport, Johns Hopkins Hospital, Sinai Hospital, Montgomery College, Kaiser Permanente, and the Emerson Corporation in St. Louis, Missouri. In addition, he has completed over twenty public art commissions in and around Baltimore, Rockville, and Germantown, and Washington, D.C.
Kathy O’Dell, curator of Gun Show, teaches and writes on modern and contemporary art, with a focus on performance and global art. The author of Contract with the Skin: Masochism, Performance Art, and the 1970s (University of Minnesota Press, 1998), she has published numerous articles and reviews in Art in America, Artforum, Performance Research, TDR: The Drama Review, Women & Performance, and other journals. Currently, she is writing a book titled The Dot: A Small History of a Big Point and is co-writing, with Duke University Professor Kristine Stiles, a survey text titled World Art Since 1933. She serves on the Board of the Greater Baltimore Cultural Alliance and the Maryland State Commission on Public Art. 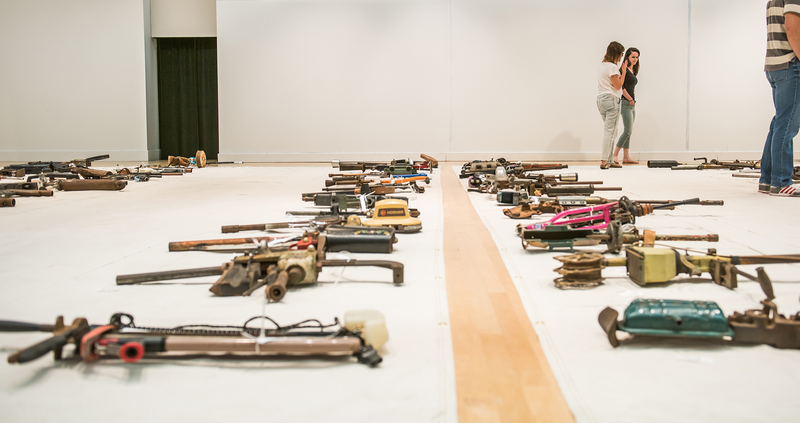 Read more about Gun Show on UMBC’s Arts and Culture Calendar. All photos by Marlayna Demond ’11 for UMBC except detail of sculpture courtesy of Geoff Graham.